Protect yourself from falls, blisters and more with our protective padding! The Unlimited Motion Palm Protector/Carpal Sleeve is designed with a medical grade mineral oil gel pad that contours to the palm and wrist area. Gel absorbs shock and provides great fall protection for hands for both goalies and figure skaters! Available in Small and Large. The Unlimited Motion Achilles Heel Gel Pad is a lightweight, comfortable, toeless sleeve that absorbs shock and vibration. It cushions, and protects against rubbing the Achilles area while releasing medical grade mineral oil to help soften and moisturize the skin. Available in Small and Large. 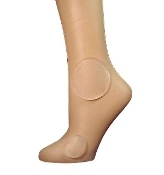 The Bunga Pads Boot Bumper is a combination between the Lace Bite Pad and the Achilles' Healpad. The gels are molded inside an elastic, latex-free sleeve. The two gels reduce pressure, shock, vibration and rubbing. They protect the front and back of the foot simulatenously. The Bunga Pads Essential Skater's Kit includes (2) 2.5" gel discs, (2) 5" ankle sleeves and (1)Clear BungaBox. These are the most common pads for hockey, figure and roller skaters. Use these core items to break in boots. 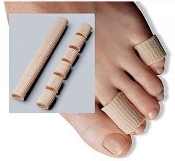 The Bungapads Finger & Toe Caps with fabric shell will protect the entire finger, toe and their related nails with a comfortable elastic cap. Comfortable and safe to use against the skin. Will protect all sides of the finger and toe, as well as the toe or finger nail against injury and bruising. 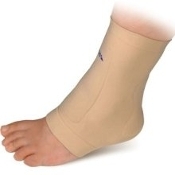 The Bunga Pads Gel Ankle Sleeve protects the ankle area. Decreases rubbing and chaffing around your ankles. Can be worn with skates and ski boots. 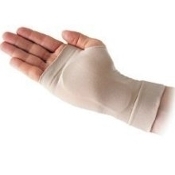 The Bunga Pads Gel Lace Bite Sleeve has a rectangular medical grade gel pad attached to a thin, elastic sleeve. Can be worn with ski boots, skates, and cleats. This product is washable and reusable and is available in two sizes. ES Performance Pro Gear Padded Skating Pants are the most advanced skating protective pants on the market. They combine very high quality fabrics with state of the art protective material made by Poron. Available in Child M - Adult L.
ES Performance Pro Gear Protective Skating Shorts are the most advanced skating protective shorts on the market. They combine very high quality fabrics with state of the art protective material made by Poron. Available in Child M - Adult L. Mondor 227 Men's Support Dance/Skate Belt. Provides light support and provides coverage under tights, costumes and skate pants. Pro-Tech Skin Cream is serious protection for dry, sensitive, damaged, and irritated Skin. Creates a natural barrier to retain your body's moisture and keep skin from drying out. The Unlimited Motion Boot Bumper Sleeve protects the front of the foot and the heel area with a high quality medical grade silicone gel pad. This product is washable and reusable. 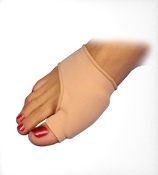 The Bunga Bunion Gel Cushion is an excellent way to the reduce pressure and pain caused by bunions and even help prevent them. Not quite sure what to buy for your special skater? Try a gift certificate! Gift certificates can be used to purchase any item. 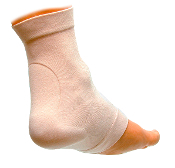 The Unlimited Motion Skating Gel Ankle Sleeves protect the ankle area. Decreases rubbing and chaffing around your ankles. Can be worn with skates and ski boots. ChloeNoel Protective Hip Pad. 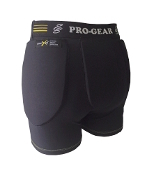 This lightweight hip pad gives you protection from falls on the ice. Available is Small, Medium and Large sizes. Unlimited Motion Gel Tubing for Toes & Fingers are fully lined with medical grade mineral oil gel to provide all around toe and finger protection while absorbing shock and pressure. Tubing can be trimmed to meet individual sizing needs. Sold as a pair. The ChloeNoel Tail Bone Pad is lightweight gives you protection from falls on the ice. Available is Small, Medium and Large sizes. Bunga Bamboo Gel Knee Pads. The first gel kneepad designed specifically for dancers and skaters. 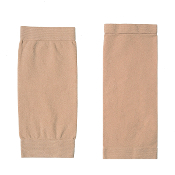 Constructed of a soft but sturdy bamboo knit fabricand contoured silicone kneepads. Two sizes available. Skating Safe Body Protection Package. Save $$ off individual purchases. Protect your hips, knees, spine and elbows from falls associated with ice skating. Made from medical grade gel. Extremely durable! 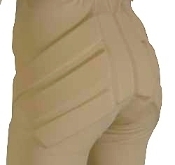 These lycra capri pants have padding in each hip, tailbone and knees to help prevent injuries. Padding is made from high compression foam. Great for skaters of all levels. Can easily be worn under practice pants or tights. Choose your size in black or beige. The Silver Lining Padded Skating Shorts have padding in each hip and tailbone to help prevent injuries. Padding is compact and the shorts can be worn as shorts, under pants, or under tights. If you wish to wear these under tan tights, then the beige will blend best. Unlimited Motion Protective Elbow/Knee Gel Pad is designed with a medical grade gel cushion that contours around the heel, elbow or knee to protect the area from pressure, friction, and shear forces. Available in several sizes. A great knee pad for smaller children. The Unlimited Motion Achilles Heel Gel Pad is a lightweight, comfortable, toeless sleeve that absorbs shock and vibration. It cushions, and protects against rubbing the Achilles area while releasing medical grade mineral oil to help soften and moisturize the skin. Available in Small and Large. The Unlimited Motion Palm Protector/Carpal Sleeve is designed with a medical grade mineral oil gel pad that contours to the palm and wrist area. Gel absorbs shock and provides great fall protection for hands for both goalies and figure skaters! Available in Small and Large. The Unlimited Motion Gel Lace Bite Sleeve protects the front of the foot with a high quality medical grade silicone gel pad. Can be worn with shoes, athletic footwear, ski boots, skates, and cleats. This product is washable and reusable. Specially designed for skaters who have new boots and/or spending long hours on the ice practicing jumps and intricate footwork. Offers superior blister and abrasion protection. Constructed from a medical grade gel. Cut them to any size or shape. Clear Clouds Gel Discs alleviates discomfort caused by your boots and offer superior blister and abrasion protection. Constructed from a medical grade gel filled with medical grade mineral oil. Clear Clouds Mini Gel Discs alleviate discomfort caused by your boots or skates and offer superior blister and abrasion protection. Constructed from a medical grade gel filled with medical grade mineral oil. Need hand protection from falls? Gel pads fit inside gloves and protect hands from an impact related injury. Constructed from a medical grade gel and will last for MANY years! The Skating Safe Lace Bite Pads were specially designed for skaters who have new boots and/or spending long hours on the ice. This pad Alleviates discomfort caused by your boots. Skating Safe Crash Pad Retention Sleeves. Holds the Skating Safe kneepads, elbow pads and ankle/foot gel pads in position. Skating Safe Elbow Crash Pad cushions against the bumps and bruises caused by falls. Very thin and made from medical grade silicone gel. Retention sleeve included to hold elbow pad in place. The Skating Safe Impact Absorber is a fabric backed gel pad stays right where it's put. Versatile Placement. Odor and bacteria resistant. Skating Safe Gel Protective Hip Pad helps protect your hips from falls associated with skating. Unsurpassed in its impact engergy absorbing characteristics. Available in 3 sizes. Skating Safe Knee Pads aren't your everyday knee pads. Made from medical grade gel to protect your knees from falls associated with ice skating. Available in 3 sizes. Skating Safe Spine Protector Gel Pad is thin, light weight and protects your spine and tail bone from falls associated with ice skating. Available in Small and Large. Pro-Tech Skin Cream is serious protection for dry, sensitive, damaged, and irritated Skin. Creates a natural barrier to retain your body's moisture and keep skin from drying out.